Perfect for transporting materials, supplies, and heavy loads in almost any environment. 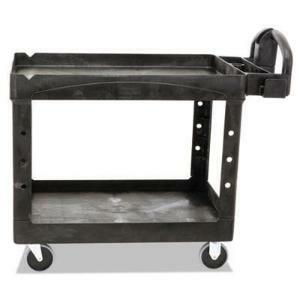 Handy, durable utility cart features rust-, dent,- chip- and peel-proof structural foam construction. Ergonomically designed push handle provides optimum hand placement and push height improving control and worker safety. Molded-in storage compartments, holsters, hooks and notches. Rounded corners and shelf walls won't damage furniture and walls. Variable grip-height handle improves control and worker safety. Built-in holster and molded-in fittings allow for easy addition of pipes or rods. Standard color is black.